This is a guest post from Jarie Bolander, an engineer by training, entrepreneur by nature and leader by endurance. Jarie combines leadership and endurance athletics over on his blog, Leading from Within. You can also find Jarie on Twitter via @EnduranceLeader. On July 28th, 2012, I achieved one of my life goals. I finish an Ironman distance triathlon. It ended up taking me 13:53:21 to complete the 2.4 mile swim, 112 mile bike and 26.2 mile run. Getting through the race took a tremendous amount of dedication, mental fortitude, support from family and friends and lots and lots of training. All organizations and individuals need goals. Without goals, we are adrift on the sea of life. Goals need to be specific and achievable for us and not what society might thrust upon us. You’ll notice that the actual times don’t add up to 13:53:21. That’s because there are two transitions (Swim to Bike and Bike to Run) that are timed separately. You’ll also notice that the time in the picture is different. My wave started 6 minutes later than the official race time. Even though I did not hit my overall goal, I’m happy with my performance since I finished before the sun went down and the cut off time. Next time, I’ll do better. Goals are great but without a plan to achieve them, goals are just empty promises. Plans are a good way to determine if your goal is actually achievable. Without a solid plan, your goals will be next to impossible to achieve. My plan to complete the Ironman was to device a training schedule that got me in shape to finish–yet not consume–all my free time. I decided that the best plan was to train by time and not distance. That way, I could plan my life accordingly. I got this idea from Be Iron Fit —an excellent book on training by time not distance. All leaders need supporters to help them achieve their goals. Supporters are also how a leader gauges their organizations impact and reach. A solid group of supporters will be invaluable for a leader and their organizations ability to get stuff done. My support network is wide and diverse. Some, like on the Impossible League, I have only met virtually, while others I see daily. These supporters were a vital part of my success because they believed I could do it and frankly, I did not want to let them or myself down. Once a specific and achievable goal is defined, a plan devised and support gathered, it is now time to execute the plan. If the plan is solid, then it will be easy to implement. If it’s not, then the desire will be to constantly change the plan. This needs to be avoided since a constantly shifting plan is just as bad as no plan at all. Executing my training plan was pretty simple —only train enough to finish. This meant I had to get the time in by training around my life. This also meant that I had to resist the urge to overtrain (e.g. Put in more miles instead of sticking to my time based training plan). Another big aspect of training is getting started. There were some days I really just wanted to stay in bed but forced myself to train instead. Those were some of the best training days I ever had. Plans can and should change when conditions warrant. Every leader needs to know when the path they are on is just not going to get them there. By zigging and zagging, you can adjust your plan according to the situation you find yourself in. I had to zig and zag a couple of times to stay on my training plan and to complete the race. The biggest zig and zag came 3 weeks before the race. I got a nasty cold that would just not go away. I had to stop training for 3 days to recover. Even after that, the cold lingered but it did slowly get better. I’m glad I rested when I did, because on race day, my cold was completely gone. The main job of a leader is to build other leaders and help as many people as they can be successful. This is the only way to create an organization that can sustain itself and perform at a high level. The same goes for individuals. The reason I love racing is because of the esprit de corp that endurance athletes have. I have never met an endurance athlete that did not want everyone to finish. For me, helping others succeed is giving my fellow endurance athletes the encouragement to endure on. This takes many forms but the most powerful one is words of encouragement. I always say something positive to anyone I may pass or passes me. Goals are meant to be completed and there is no better feeling than pushing hard to finish strong. Finishing strong is all about enjoying the final movements when the plan comes together, the team is excited and the finish line is in sight. 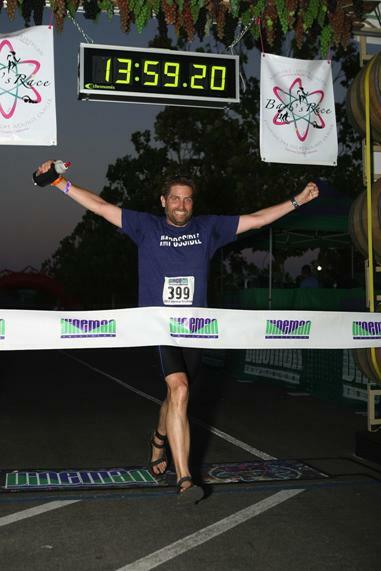 The picture that accompanies this post is me crossing the finish line. Notice that I’m in full stride, arms raised and smiling. Sure, I was tired and sore but I felt the energy of the crowd, the courage in my heart and the pride in knowing that I did it. A leader can never say thank you enough. It’s probably the most important two words a leader will ever utter other than I’m sorry. Thanking supporters not only gives them the recognition they deserve but it also reinforces the fact that it took others to achieve the goal. I had a lot of support in my quest to be an Ironman. Some of this support was from people I met on the course (thanks Michael), those online and all my friends and family. To all of you, thanks! The great thing about finishing a life goal is that inspires you to want to achieve another one. I’m not exactly sure what’s next but two things keep on popping up —an ultra-marathon or a Goruck. Whichever one I do (I might do both), I know that I’ll apply these same leadership skills to finish strong. Thanks for the opportunity to share my story with all your Nerve Rush readers. My next endurance challenge is the Goruck Challenge on Nov 3rd. It should be a ton of fun.